Does what it says on the tin: it is a balloon and you put it up the chimney. We have a fireplace that is unused, because we have underfloor heating in our half of Trullo Azzurro, and we use the opening to house a cupboard. The chimney balloon will stop hot air going up the chimney and rain and bits of grit coming down. The first chimney balloon we bought was way too large because we ordered from memory basing it on the size of the fireplace. Unfortunately it narrows rapidly into the actual chimney so it didn't really work. 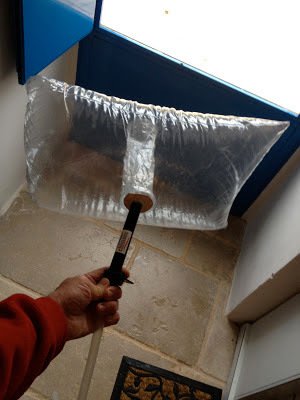 This time we ordered the small rectangular balloon from ChimSoc which fitted well (insert, inflate and turn the tap) with just a tiny gap along one edge which is recommended anyway. That should do the trick then. Interesting to see how well it stays inflated at our next visit.